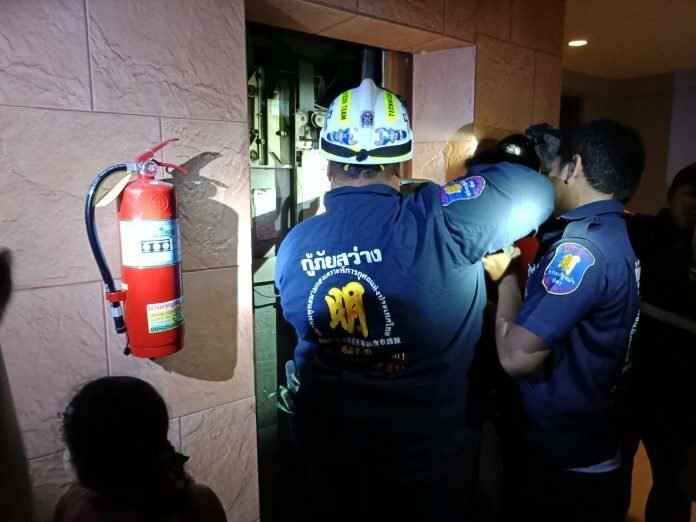 Rescue services were called to the Spanish Place Condominium on Sukhumvit Road after seven tourists from the Philippines and a Thai got trapped in a lift. Anguished cries greeted the rescuers when they arrived - oxygen was scarce and they had been trapped for half an hour. Lap Jankaew, 50, said he and his Filipino friends had been to a party on the fourth floor. But when the lift got to the first floor the doors would not open. Special equipment was used to effect an escape and all those involved were safe. Who are all those guys with chinese letters on their back? Chinese medic and rescue service? It's the omnipresent " Sawang Boriboon" rescue foundation (transcription may vary). I don't know about their history but obviously the "Thai Chinese" community plays an important role (as in other fields of society ). "Thai Chinese": Thai citizens of Chinese origin. The Thai must have been worried that he would be the first to be eaten. We are all trapped in some ways. Scares me. I'm super claustrophobic. Trump wasn,t there they were philipino....they "trouser cough"
That's the true definition of "democracy." Good catch. I'm sorry, but you are wrong. For all we know, they could have been served copious amounts of beef and bean burritos. Depending on the size of that elevator, the oxygen content of the lift could have well be compromised. I usually let one loose in the lift but always blame it on my boy. That Spanish place condo is probably the worst condo you could choose to live in. One of the oldest buildings and maintenance is not good. But I guess the tourists must have rented through AirBNB. It took worse than a nose dive once the owners split the place the up and then stopped paying the cable bill and let both pool go to trash, I owned a nice double unit in there when it was really nice and loved the location.